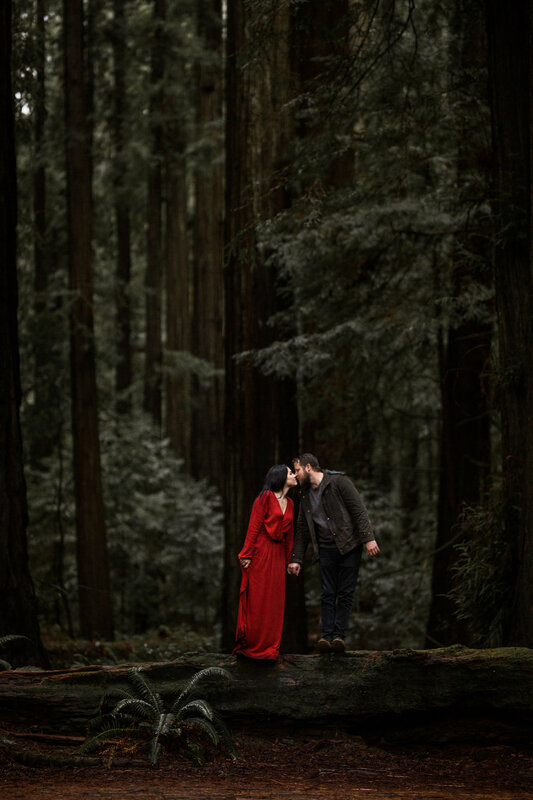 I have been dying to shoot in the Redwoods ever since the first time I visited back in 2016, so when Nikki and Dustin reached out about an engagement session in Humboldt National Forest - a park filled with some of the oldest Redwoods in the world, it didn’t take much convincing! It’s a good thing that these two were up for an adventure because as national parks typical do, these Redwoods had one in store. We scheduled their engagement session for mid January, which we all knew might be rough weather wise, but was the only time schedules would allow for. The few days leading up to their session, the weather reports showed rain, rain and more rain. Luckily, the Redwoods are MASSIVE, and their canopies are basically like a roof, so we had some coverage, but still rain. The day before, we looked at the possibilities of moving the shoot to the next morning, but I gave Nikki and Dustin the final call, and they were down to adventure, rain or shine! We met up in the afternoon, and began our adventure through Humboldt National Forest, hitting a few of my favorite trails! They brought some wine and a blanket, and totally made it a date - I just tagged along as their third wheel ;) The rain slows started to creep through the canopy, and luckily, there were some Redwoods with hollowed centers that acted as little caves for them, but that only lasted so long. Eventually, rain took over, but Nikki and Dustin totally embraced it. Nikki was sliding around in the mud, they were giggling, dripping wet, but literally dancing in the rain. We hit the cars for a break, Nikki cranked the heat in their car to try and dry her hair a bit, and we headed out for round two. The rain held off a decent amount for the second half of the session, so we had balance! I call them adventure sessions, and I swear, they’re ALWAYS an adventure. I don’t think I’ve ever had a single one go completely perfectly + to plan, no matter how much prep work is involved - but I guess that’s what happens when you’re working in landscapes that are filled with lots of elements you can’t control! My couples have always been rockstars at embracing it, going with the flow, being flexible, and just having an adventure together - which honestly, I think is the best way to go about life too! Alright - did you go through this adventure session and think dang, now I wanna elope in the Redwoods!? Yeah, me too! If you’re planning an elopement in the Redwoods National Park or want to explore Humboldt National Forest for an adventure session, get in touch and let’s get the party started!